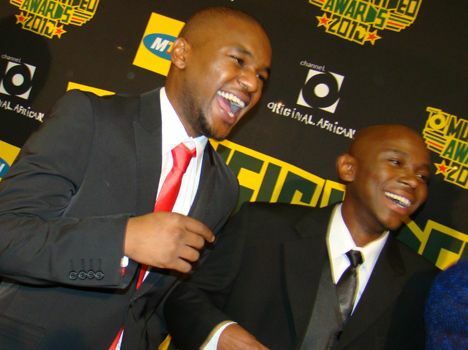 Lungile 'Lungsta' Radu and Thomas Gumede: hosts of the 2010 Awards. Hosts for 2011 haven't been confirmed yet. Channel O has announced the nominees for the channel's upcoming 2011 Music Video Awards. The awards are in their eighth year this year and recognise videos that have achieved the most popular appeal on the channel over the past year. Last year's ceremony was held at the Sandton Convention Centre and aired live for the first time. The venue for this year's awards hasn't been confirmed yet - we'll keep you posted when it is. You can also vote on MXit and via SMS by SMS'ing the SMS codes to: 083 920 8406 - if you're voting from South Africa; or +27 83 920 8406 if you're outside of South Africa. You can vote in each category as many times as you like, but only once per hour per category.